I find it hard to believe that my little Pudding will be 5 years old soon. When your child has additional needs, birthdays can sometimes be a stark reminder of milestones missed. This year though, it’s a new challenge that is facing me. The birthday party! Last year he had only just had an operation to fit a portacath into his spinal canal, so we didn’t do much for his birthday. So this time it will be his first proper birthday party. First decision was where to hold it. Pudding has been to a few parties recently in a hall with an entertainer or bouncy castle. Whilst he has enjoyed himself at these events it’s been in an ‘excited by the general atmosphere and balloons’ way rather than in joining in with his peers. I want his party to be one where he can take part on his own terms, so I’ve gone for one of the local soft play places. These are definitely not my idea of fun, but kids seem to love them. This one is relatively small, so Pudding won’t be left behind while more able kids enjoy the bigger equipment. And I’ve been able to book exclusive use, so I don’t have to worry about him throwing things at complete strangers – his friends will be pretty used to his ways so I’ll worry less about them! Guest list was next. Being minimally verbal he can’t tell me who he wants there. Of course there are some obvious candidates – Niece is top of the list, and I’ve got to know some of the children in Pudding’s class who seek him out. His TA has helped me out with a list of other children he plays with regularly. As many of you will know already, P is a bit of a character! Most presents for a five year old are not really appropriate and even I have problems buying for him. If, instead of a present, you would like to make a donation to a relevant charity that would be fantastic. We suggest the MPS Society (http://www.mpssociety.org.uk/) or the children’s hospice Martin House (http://www.martinhouse.org.uk/). If you’d rather not do that, please feel free to ask me for gift ideas. But most importantly don’t feel like you need to do either! He’ll have an absolute ball at the party and playing with his friends will be the only thing that matters to him. Hopefully I won’t offend anyone with that! Sorted. Now all I have to do is decide on the theme for this year’s cake. And the best thing of all? When I took him into school yesterday, one little boy came and asked me how to sign ‘Happy Birthday’ in Makaton because he wanted to say it to Pudding. I could have literally melted on the spot. Instead I had to admit that I didn’t know – but I’ve learnt it now! Ah, the post-Christmas clear out! Finding space for all those new toys often means a ruthless look at the old ones and the filling up of various charity bags. Added to that, moving Pudding into his own room has given the perfect opportunity for some reorganisation and de-cluttering. Reaching under T’s bed to pull out what was stored under there I nearly choked on a few year’s worth of dust. (Think I might have mentioned my lacksadaisical approach to cleaning before?) I hauled out the musical instruments to put on Pudding’s shelves. The kitchen play sets would still get plenty of use. Building blocks and dressing up fitted nicely under Pudding’s bed. And then I stopped, confronted by two boxes of jigsaws and first readers’ books. T grew out of them a while back, so a few years ago I packed them ready to pull out when they were needed again. There they have stayed. I’ve come across them lurking there since and pushed them back again knowing that their time was still not here. I wonder now whether their time WILL ever come. Will he ever be able to do a 50 piece jigsaw or learn to read? I don’t know. The brain is a wonderful thing. People with significant brain injuries can learn to walk again, or talk, or any number of amazing achievements. Yet there are individuals who are fully functioning in all other respects but never learn to recognise faces. I found the neuroscience module I did during my degree absolutely fascinating, but if there’s one thing I learnt it’s that there is so much we don’t understand. Perhaps this treatment will clear his brain of waste products. Perhaps he will learn and progress more. But perhaps he won’t. It may be that he will always remain a two or three year old cognitively. I can look at others with the same condition who are also on the trial but I just don’t know. Monday and Tuesday we were in Manchester again. It is the end of Pudding’s first year on the clinical trial that aims to halt the progression of Hunter Syndrome in his brain. 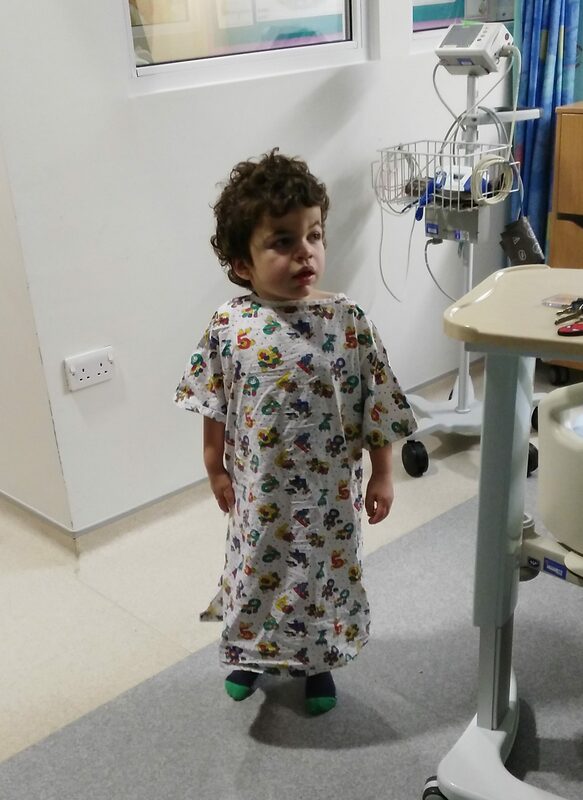 So he needed to go for an MRI scan and lumbar puncture under general anesthetic. It’s been an emotional journey of course. First there was the decision to enter the trial when the potential good had to be weighed against the negative implications. There was the major surgery itself meaning the placement of a portacath into his spinal cord. The first few months when he reacted with sickness, and then the gradual easing of tension as the reactions were brought under control. The waiting game as we wondered whether it would help him at all. And the slowly dawning hope that as he approaches his fifth birthday there is no sign yet of him losing skills. Indeed he seems to be gaining them. It is little things. Things that other parents would hardly notice. Like me asking him to turn on a light that was beside him and him doing it. Like me saying ‘good building!’ as he played with his blocks and him responding ‘da dyu!’ (his version of thank you). So although the results of this end of year MRI scan won’t be available to us, I’m pretty sure it will be positive. Enough boys with Hunter Syndrome have now been recruited onto this study and while we wait for them all to complete the trial year, Pudding will join others on the extension study. They continue to receive the monthly doses but with less regular blood tests, ECGs and so on – something both Pudding and I will be very happy about. At the end of this calendar year, Shire (the pharmaceutical company who developed this drug) will be putting the numbers together and starting the process of getting it approved as a treatment. I should be feeling positive. Yet my newsfeed has been filled this week with stories of an NHS in crisis. Not enough beds, not enough doctors, not enough money to treat an increasing number of patients. With these sort of pressures who is going to sign off an eye-wateringly expensive new treatment? Right now I should be filled with campaigning zeal. I should be writing to my MP and demanding to know what can be done to save the organisation that could save my child’s life. But I know what the response will be. The NHS is ‘very important to us’. ‘We are doing all that is necessary’. Health funding is at ‘record levels’. From your too-short trousers to the five slab-like new teeth in your mouth, from your enthusiastic love of The Kinks to your adult way with words sometimes, I can’t help but notice it. Often lately I look at you and see the teenager you will become. It will be a while yet, but you’re more than half way now. It is bittersweet sometimes thinking of your future, wondering how far along that path your brother will follow you – mentally or physically. But whatever you do, I’m pretty sure you’ll be a heart-breaker. I can’t quite believe I gave birth to such a handsome boy (yes, I know I’m not allowed to say that, but it’s true). Your emotions can still be a little…um…shall we say, volatile at times (can’t blame you for that one really; mine are too!) but you are getting so much better at weathering the storm. You stomp upstairs as if the world is ending but a minute later you’re back down like nothing happened. While we had to move Pudding to his own room to keep him safe, I’m also glad we did it for your sake. I love that you now have your own space to retreat to in times of need. You can shut the door to keep your brother from destroying your precious things and spend hours in there listening to music and acting out elaborate scenes with Lego. I’m sorry I get frustrated sometimes and snap at you. I do try to stay patient, and I hope that soon you’ll understand that the things I say over and over again (like ‘Don’t bother your brother right now, or he’ll hit you’) are usually for your own benefit. For now, I guess the most important thing is that however upset you get with me, you always seem to have more empathy with Pudding. Even though you hate getting hit by him, you show your love for him every day in so many ways. You look out for him at school and tell your friends about him proudly. You encourage him to join in games with you and build him towers to knock over. You spring to his defence if I ever joke that I’ll put him in the dustbin. Even a grumpy old Mummy like me can’t stay angry with you for long when I see you run to him for cuddles. It is not always easy having a sibling who is a bit different and yes, it does mean that sometimes you miss out on things we would be able to do otherwise. But along the way you’ll learn a lot too. You already have – after all, there aren’t many six year olds who can read the word ‘mucopolysaccharidosis’. When I first started this blog, I wanted to keep a bit of privacy for our family and not use our real names. I decided to refer to you as Twiglet and Pudding – both names that I used when I was pregnant. Pudding is still just one of the many nicknames that I use for my littlest boy, and one which I am pretty sure he won’t grow out of in a hurry. Twiglet though…? Well, now you’re nearly seven it just doesn’t seem to fit our closer-to-growing-up boy. So, it will be T from now on. Bye bye, Twiglet. It’s been nice knowing you. As you run into your future, I look forward to getting better acquainted with your alter-ego. I think he’s going to be amazing! PS. Getting to your chest of drawers is a bit of a Lego minefield. Do you think the minifigures could retreat to a more strategic location every so often?